A slightly surreal – and very cool! – day began with me being escorted by a handsome, besuited flunky down to the lavish new screening room at the bizarrely overdecorated Soho Hotel. After watching the film, and lunch, we were bussed down to the National Film Theatre, where Phil Jupitus, introduced us to Mr Bird and hosted an amusing and informative masterclass. He then talked about how he creates detailed storyboards, so that every camera angle and effect is worked out before starting the costly animation process. We watched a section of animated story reel that was contrasted with the finished film. It was really interesting to see how precisely everything was worked out at this stage; essentially everything was there, it all worked, except it was a series of black and white sketches. We then went through the stages showing the animators’ first pass at a scene, then adding realistic movement, backgrounds, clothing, hair, lighting etc. He explained how this then minimises the final editing process and is very cost effective (which he learned working in tv and on the lower budgeted Iron Giant). One of the unusual things about The Incredibles is the lighting. For a cartoon, the film is lit in a ‘real’ way – night is dark. Brad talked a little about how his team used lighting to create a mood and communicates the story, heightening the emotional impact of a scene. For instance, at the beginning of the film everything is very light and happy; the lighting is very flat in the middle section and then brightens again towards the end. HAIR! This subject came up again and again. Daughter Violet’s long black hair was one of the biggest challenges. Long hair had never been done before, and one scene in particular, where Helen touches Violet’s hair, brushing it out of her eyes, was apparently both extraordinarily difficult AND expensive to animate, and also tragically will go unnoticed by the average movie-goer, though animators will watch it and weep for joy. We then watched some more behind-the-scenes material showing how the animators get the live action references they need. How do you animate someone picking up something heavy – how do you express that sense of weight? So we saw Pixar employees walking, lifting things up, acting out scenes from the film. All good stuff. Brad emphasised that the most important thing was for the animators to understand the characters, so that their emotions are communicated – the animator has to know what the character is thinking and feeling in very much the same way as an actor explores a character’s motivation in a scene. Building humans: the characters have to look compelling and believable and yet cartoony and appealing. The Oscar-winning Geri’s Game convinced Brad that humans were possible, but Pixar still had to develop new technology to realise them. Brad explained that he didn’t want The Incredibles to look photo real. Their skin was to be flawless, not freckled or spotty; stylised, but not as if made out of plastic. They achieved this through light – people look real because skin is translucent, light doesn’t bounce off it. This quality applied to the film helped the puppets to look real. Costumes in The Incredibles were another challenge – how do you design clothes to fit a character with a 13” waist? The crew actually employed a tailor who taught them pattern cutting, and had to learn to create fabric that moved with the characters, bulged when they bulged, stretched when they stretched. It was a real shame when the masterclass wound up because it was fascinating, but we had to move on to the press conference. Q: As well as writing and directing, you wound up voicing one of the characters, Edna Mode. As you’re not a 2’6” Japanese/German designer, where did Edna come from? A: I’d always wondered where superheroes got their costumes. I mean they always have fantastic costumes, and occasionally you see a superhero sewing in the basement in an attempt to address this, but what would they know about fabric. Someone had to be designing the outfits, and must also be technical. So I thought small and hi-tech, and I thought Germany and Japan. Q: Does the performance of the actors influence the look of characters? A: Sometimes, but only if its useful. For instance, Holly Hunter talks a bit off centre, so we incorporated that mannerism. But the animators get their ideas from all sorts of places. Q: Was there a resistance to the violence and deaths from the studio? A: I like to feel a genuine sense of jeopardy in a film. Overprotection of children leads to a depiction of violence without consequences, which is a really bad message. Death exists; life goes on though bad things happen. A: In the 60’s, with Sean Connery as Bond. Not now, no! Q: The film contains a darkness and wit rarely seen in American films – was this deliberate? A: Not really – you just set out to make a film you want to see and hope that others will too. Q: How close is the finished film to your original vision? A: It’s the film I set out to make, despite some changes. I had to let some things go – originally we had a different villain, for instance. But I’m very happy. Q: How was the villain different? A: Originally Syndrome was a minor character, a mouthpiece for the real villain. But people preferred Syndrome so we made him the villain. A: I’ve a little ham in me, yeah. Q: The Incredibles was clearly a mammoth undertaking – what was the biggest hurdle? Q: “If everyone’s special, no-one’s special” seems to be a theme – how did you come up with this idea? A: On sports day my kids all get a prize; this devalues ahievement and the efforts of the kids who have busted a gut to do well. 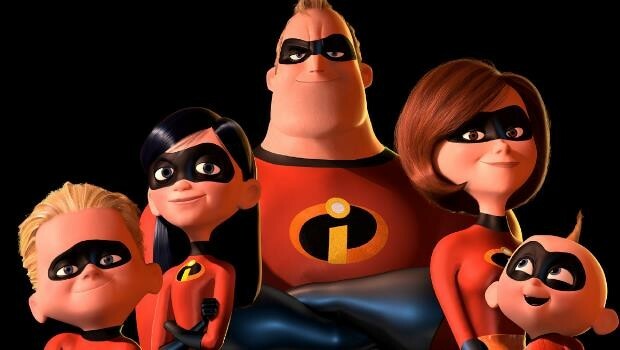 Q: Did working on the family in the Simpsons influence the Incredibles? A: No I already knew a lot about families! Working in tv taught me a lot more about decision making. Q: Did you deliberately set the film up for a sequel? Q: Would you go back to smaller films? Would you do live action? A: I want to direct animation and live action and a mixture of both. I have lots of ideas, big and small – but the most appealing are the ones that seem impossible.